I’m not going to describe each photograph or even a photograph from each photographer. Instead I will focus upon photographs/ photographers that particularly interested me and why. This is the first photograph which greets you as you enter the Exhibition gallery. 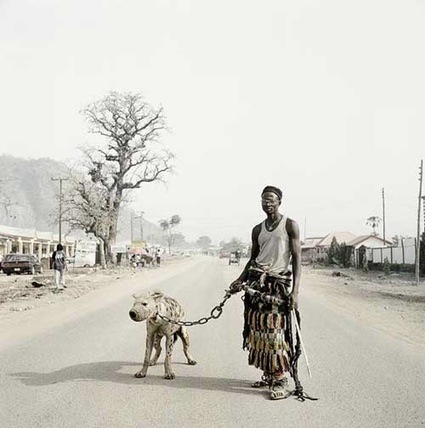 The photographer is Pieter Hugo and this image is part of a set Messina/Musina which raises questions regarding race and the nature of family (http://www.pieterhugo.com/messina-musina/). His website includes transcript of an interview where he talks about the portraits he took of firstly couples then families. He makes an interesting point about the dynamics which took place between adults and children when he ‘gave them a bit of space with minor art direction’. He also talks about the way in which he is subverting the unreality of commissioned portraits by applying the notion of commissioned portraits (ie a perfect family) and showing it in a different way. So far as this particular portrait is concerned you can look at it in different ways – grandparents with child or foster parents for example. However, Pieter Hugo tells us that this is the little boy of their landlord and they are taking care of him because the father was shot during a heist and is in hospital. 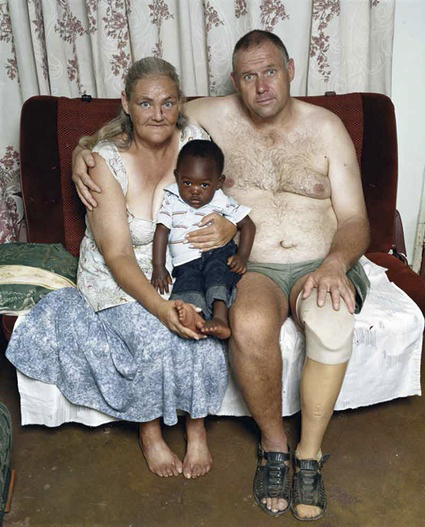 Of course, this portrait is also subverting another, older stereotype – that of a black nanny taking care of a white child and there is such a photograph in another Exhibition of photographs taken by David Goldblatt during the Apartheid years. There is obviously more context in the second portrait. Here is the older lady; with an insouciant air: in her kitchen, with cigarette in hand. I almost expected her to have a cocktail in the other. I had a mini discussion about these images and we agreed that those poses are the kind that we might make in the privacy of our own homes when we’re examining our figures and how we look. In that sense, to me, some of us are sharing the same concerns between two cultures. I’ve seen these types of image before, particularly in the Dove advertising campaign but also in various women’s magazines and I think it’s good for photographers (particularly women photographers) to be subverting media representations of ‘the perfect woman and how she should look’. Against this, I contrast another photographer taken by Bieber which is not in this Exhibition. This is of a beautiful Afghan young woman whose face was brutally mutilated by her Taliban husband and in-laws for seeking protection from their brutal treatment. The powerful image appeared on the cover of Times Magazine. A fund was set up – The Bibi Aishan fund (http://www.womenforafghanwomen.org/front_lines.php) for Bibi’s care and she received reconstructive surgery. There’s such a contrast here and I first thought that “Real Beauty’ seemed a rather banal series. However, most women are affected by society’s expectations of ‘the perfect woman’. We go as well from the stark contrast between aspirations towards beauty and those who wish to destroy it. The collection draws upon the anthropological conventions once used for cataloguing ‘racial types’ by subjecting them to photographic display and measurement, with, this time, the Afrtikaners being seen as ‘other’. I am therefore assuming that Van Wyk chose only those young people who conform to this ‘type’. Obviously this is a negative as it were of similar photographs of black ‘racial’ types and the black backgrounds also contribute to making them look very ‘white’. I’ve been asking myself why these young people wish to define themselves by how similar they are rather than how different they are from each other but, having looked again at Roelof Van Wyk’s website (http://roelofvanwyk.wordpress.com/), I can see physical differences in face shape and hair colour for example. Born in 1930 (and so the oldest photographer in the Exhibition) has photographed his native Country since the late 1940s. He continues to work in the documentary tradition. 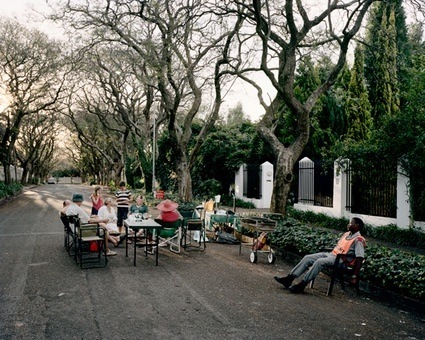 His earlier photographs were in black and white and I looked later at a display of his work from the Apartheid years. Tradesmen is one of the projects shown in the Figures & Fictions Exhibition. Artisans were photographed at their workplaces next to hand-painted roadside signs advertising their services. I was particularly attracted towards one of Ericson Ngomane who is a painter. I haven’t been able to find an image of it but the colour looked mellow and almost duotone. I discussed this with one of our tutors, Jose Navarro and he said he thought it was achieved through bleach bypass – a process which desaturates colour and then increases contrast. Subotzky’s recent work captures the structures and rituals of surveillance and this photograph is from a series, Security whose subject is the guards employed by the middle and upper classes for protection. I had recently been involved in a street party to celebrate the Royal Wedding and it was initially the contrast with my own experience which drew me to this image. We had a sunny day with lots of colour, activity, movement and enjoyment. The street party here looked static, hemmed-in. I explored it closely and spent time trying to work out how the effect was gained. The colours are almost de-saturated with heavy red, oranges and greens. There are quite a few people but they look almost huddled together around the table. The guard is some distance away and looks half-asleep. There is a barbecue which, in the perspective almost looks like a barrier. The gates and railings could just as well be keeping the people in as keeping others out. From the way the light falls it looks as though the sun is setting and, if I was being fanciful I might almost say it looks like a metaphor for the sun setting on a society which used to rely upon the subjection of one people for the benefit of another. This series represents a set of caves used as both a Christian prayer site and a place of traditional healing. The leaflet states that, “He has long been engaged with the poetic and symbolic potential of black and white photography. To me they had an old testament feel and a lovely use of shadow and light to create a sense of mystery and spirituality. Colour; muted tones,; shadow and light; images exploring links between the past and present South Africa and also some universal preoccupations. There was so much to see and discuss at this Exhibition and I’m pleased I had the opportunity for the visit.